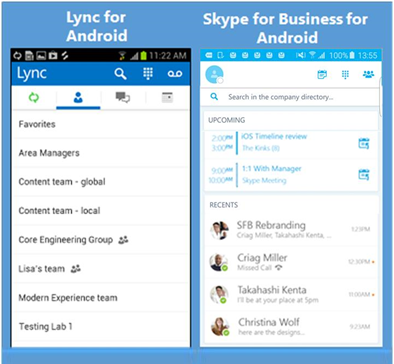 Lync for Android has become Skype for Business for Android. The change brings a fresh new look and simplified controls to all the features and functionality you already know. Want to skip the questions and get right to business? Get all the information you need to get started using Skype for Business for Android right away. Download the Skype for Business for Android Productivity Guide. What's new in Skype for Business for Android? Skype for Business for Android includes a new look and feel, at-a-glance view of your upcoming meetings and conversation history, easy call control, and other improvements. And, if your organization uses Skype for Business Server 2015, the ability to communicate with your Skype contacts using IM, audio call, and video call. We've spelled out all the details in Explore Skype for Business on mobile devices. See that article for the full story. You can go to the Google Play Store to download it. If you already have Lync 2013 on your device, you will be prompted to update to Skype for Business. Does Skype for Business run on all versions of Android? Skype for Business runs on Android 4.0 and later. The update to Skype for Business is available through the Google Play Store to all users with Android version 4.0 or later. Once the update is installed, your contacts and meetings will be there and will work just like they did in Lync. I've never used Lync or Skype for Business on my Android phone. Where do I get it? To use Skype for Business for Android, you need a Skype for Business or Lync account—typically the same user name and password you use when signing in at work or school. If you're already using the desktop version of Skype for Business, then you have a Skype for Business account. You can download it from the Google Play Store. See Install Skype for Business on Android for more information.